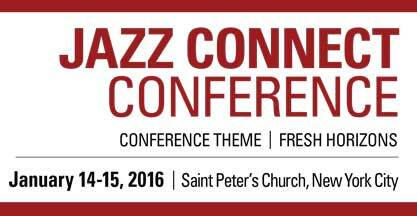 The Jazz Connect Conference will take place Thursday, January 14 and Friday, January 15, 2016 at Saint Peter's Church in New York City. The program includes over 20 panels and workshops addressing a wide array of timely topics and issues, such as social media, presenting, radio airplay, media coverage, booking opportunities, audience development, music streaming services, music licensing and many other practical areas. Panelists include both artists and industry professionals. The inimitable singer/radio host/actress/bandleader Dee Dee Bridgewater will give the keynote address at the conference. Over the course of a career spanning a few decades, Ms. Bridgewater has evolved into a true ambassador of jazz, with the United Nations as well as the Thelonious Monk Institute. The keynote session will also include "Solo Spots" or short presentations by Dave Douglas, Jimmy Greene and Joel Harrison (American Pianists Association), as well as the presentation of the Bruce Lundvall Visionary Award to Brice Rosenbloom. In addition, there will be numerous special events, such as an opening mixer reception sponsored by NPR Music and "Jazz Night in America," the nationally-syndicated radio program that also features state of the art video. On Friday afternoon, The New York Chapter of The Recording Academy is sponsoring a screening of the film documentary “Jaco" presenting the world of bassist extraordinaire Jaco Pastorius, considered by many to be jazz's last great innovator on an instrument. Featured film interviews include commentary from Sting, Herbie Hancock, Wayne Shorter and Joni Mitchell. A panel discussion (moderated by Christian McBride and featuring filmmaker Paul Marchand, as well as Randy Brecker, Mike Stern and Bill Milkowski) examining his life and music will follow the screening. The Norwegian Consulate General is presenting a panel on jazz in Norway and will also host a performance by guitarist Lage Lund and a "wrap-party" to close out the conference on Friday. The much-discussed biopic on Miles Davis by Don Cheadle, "Miles Ahead," is the subject of a session hosted by Ashley Kahn. The panel will show some clips from the movie and talk about how the music was created for the film; speaker include artists Robert Glasper and Keyon Harrold, music supervisor Ed Gerrard and representing the Miles Davis Estate, Vince Wilburn. The conference also includes the popular "Ask the Experts" session in which members of the jazz community get the opportunity to meet face-to-face for 10 minutes (speed-dating style) with influential and experienced industry leaders representing these issue areas: Labels/Recording/Product Management; DIY Management/Fundraising; Marketing/Social Media; Publicity/Promotion; and Presenting/Booking/Touring. Interested parties can sign up on-site. The conference is organized by JazzTimes and the Jazz Forward Coalition. The host hotel is the DoubleTree Metropolitan at 51st & Lexington. For more information on the Conference or to register for the event, go to www.jazz-connect.com. The Conference hotline is 617-315-9158.